Even though the iPad is still dominating the market of tablets, Toshiba is attempting to catch up with their new line of Tegra 3-based tablets. At its last launch, the Excite 10 LE was underwhelming at best: the tablet was well designed and smooth, but the performance didn’t live up to the promises of the high price tag. Today, however, Toshiba launched a new 10, 7.7, and 13 inch tablet with new specs and new hardware in an attempt to make them a firm competitor for Apple. The new Excite 10 offers a larger screen and a light weight of 1.32 pounds, which is a fraction of a pound more than the Excite 10 LE. The 7.7 weighs only 13 ounces – less than a pound – and includes a microSD slot and 1 GB of RAM. 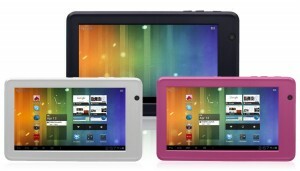 The 7.7 is also the second tablet in the Toshiba line to sport an AMOLED screen that gives it a sharp, quality display. It also features a 5 megapixel camera. The 13 is simply a larger version of the 10 and does not feature the AMOLED screen. The Toshiba tablets range from $450 all the way up to $650 for a 64GB version of the Excite 10. Currently, Toshiba’s main competitor appears to be Samsung with the Galaxy Tab. The price tag on the Galaxy Tab is around $700, and it comes with less storage than the Excite 10. Experts believe the tablet was launched during this time of the year to counter Google’s Nexus announcement. The Nexus Tablet is set to launch later this summer with a $200 price tag, and the Asus Memo 370T is set for September at $250. The prices of the Nexus and the Memo are less than half the prices of Toshiba’s devices, and the tablets are already promising to bring more to the table hardware-wise. If a tablet is what you want, Google may be bringing it to you this summer for a reasonable price.